As usual I took these photos a long time ago but am only posting them up now hahaha. Anyway most of the products used are from Yves Saint Laurent Beauté & Etude House as they were sponsored for me to try! I currently do still use some of these products & I'll say which at the bottom. First up would be the YSL roll-on Wake-up Eyecare which is meant to soothe & brighten tired eyes! Basically there will be a "cooling" feeling when you apply it. Let it be absorbed then apply your concealer over it! I am still using this YSL concealer for my dark eye circles & other red areas. Next would be eyeliner! I find eyeliner quite important; concealer + eyeliner is usually sufficient to make me look good enough to go out! 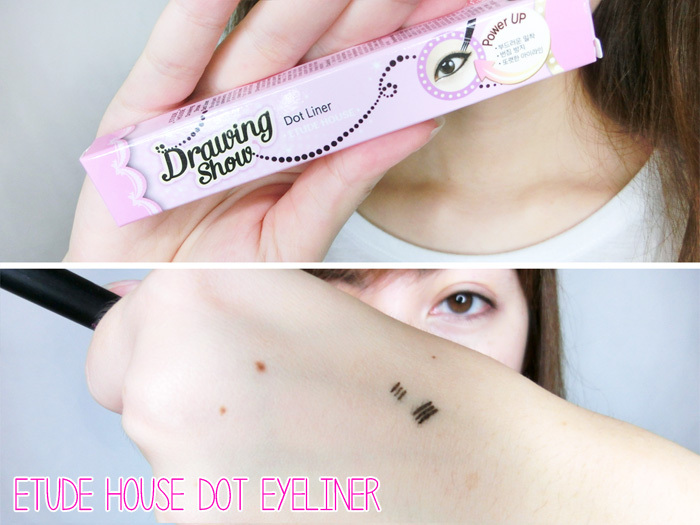 This Etude House Drawing Show Dot eyeliner is a special 3-pronged eyeliner to help you create fake eyelashes by drawing vertically! The lines I drew on my hand are examples of how it'll turn out based on the amount of pressure placed. I actually use it like a normal eyeliner & just draw a horizontal line by turning it lengthwise! So that's me with concealer + eyeliner, which is a simple uniform line that's extended slightly beyond the end of my eye. I draw a thin lower lashline with the same eyeliner & connect it to the top's. Here I tested out the 3-prong function by drawing the vertical bottom eyelashes! 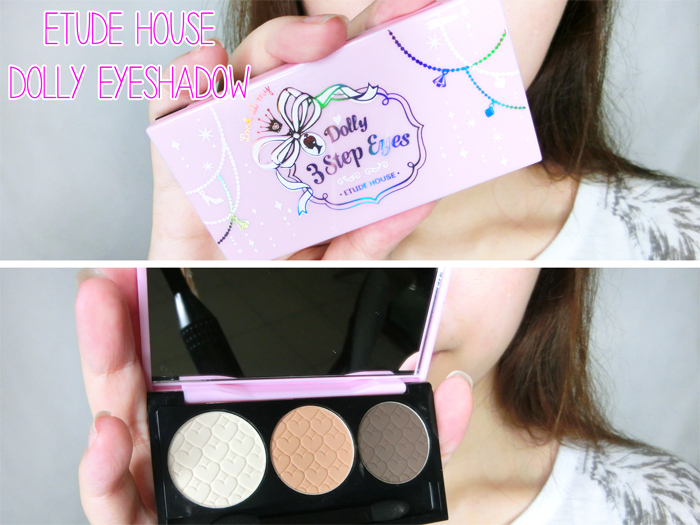 Cute eyeshadow palette from Etude House! I like the colours they have here because I generally am not very adventurous with eyeshadows, I tend to stick to dark & light brown or shades like dark purple/green. I used to use white/silver eyeshadow sometimes but now I can't be bothered. Anyway the Etude House eyeshadow is very matte, meaning there is no shimmer in it at all whereas most eyeshadows commonly are more towards the metallic side. So it's up to your preference! I didn't blend the eyeshadows that well but never mind lah, cannot see one hahaha. P.S. 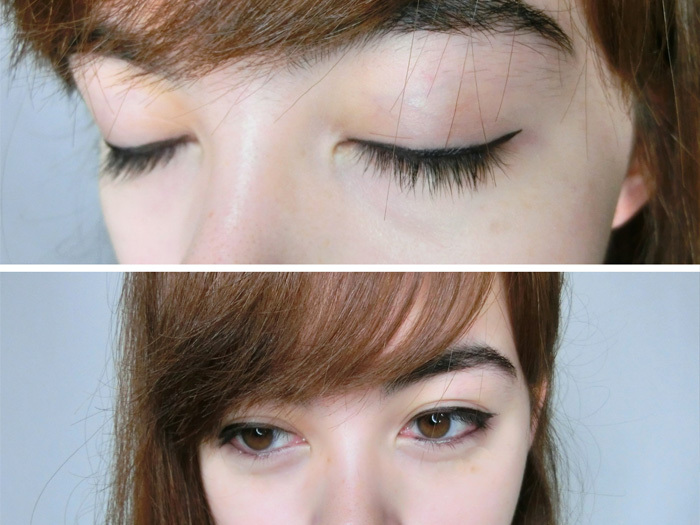 Remember to curl your eyelashes before mascara application! 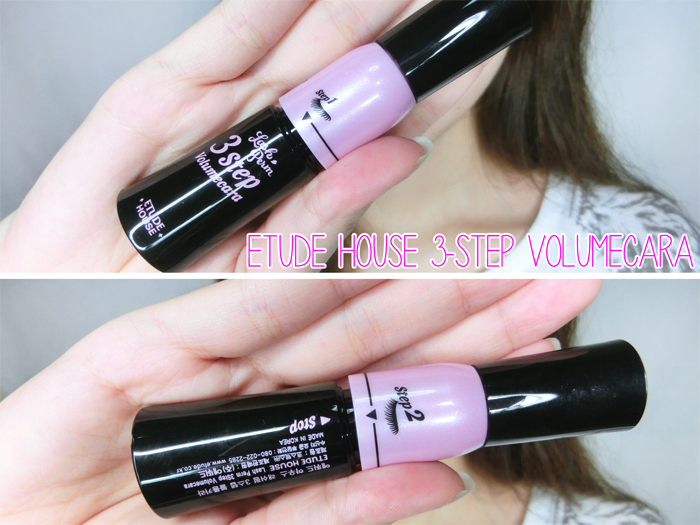 The Etude House 3-step Volumecara gives you 3 different options for mascara intensity! I don't know how they designed it inside the tube but basically you twist it to your desired intensity, with Step 1 being the mildest & Step 3 the most vava-voom! You can actually see a clear difference between Step 1 & Step 3! Step 3 is much thicker & fuller, so Step 1 may be more suitable for day-to-day use! Etude House blusher! Actually I'm not very sure what having the 2 shades of pink is for haha. (This is why I am not a beauty blogger) But I think you sort of mix it together? I just swipe my brush across it & it seems fine. My brush is possibly a foundation brush or whatever, but I like it for my blusher. I always smile when I apply my blusher (yes I have been observed doing this & have been told how retarded I look) because you should use the apples of your cheek as a gauge! Apply outwards towards your hairline; I apply mine along the bottom edge of my cheeks. These Burt's Bees ones are a bit pricier ($9 I think?) than normal drugstore brands but I find it more nourishing (normal brands don't seem to do anything for my lips) & they smell good! I have 2, one for my bedside & one that I carry in my bag. Anyway if you don't mind the slightly higher price then I would recommend these! My favourite product from YSL - their lipstains! It's something like a cross between lipsticks & lipglosses. I dislike the stickiness of lipglosses & lipsticks can be a bit too dry so these lipstains are perfect! They allow for a very consistent colour that doesn't come out cracked or patchy the way lipstick might (especially for girls with dry/chapped lips like mine). The brush makes it very easy to apply as well! Good for corners & uh.. precision haha. On a day-to-day basis I don't wear all the makeup items. I hardly wear eyeshadow because I find it doesn't make much difference to how I look haha. And mascara is a bit peskier to remove! Ok the two pictures are practically identical but there you have it! I have other products to review (some purchased, some sponsored) so I hope to do that soon LOL. Hope this little walkthrough helped! But I think my makeup skills are pretty basic so this is really for like... makeup noobs hahaha. I don't even know how to do all the shading/contouring stuff & am a complete retard at makeup brushes. So complex wtf! 9 comments on "Makeup Tutorial"
Yep! I think there may be YSL counters in stores like TANGS but I'm not sure. What about your brows? Do u draw them? No I have naturally thick brows.